For the last couple of months, Chael Sonnen has been berating several Brazilian fighters through Twitter, taking most of his shots at Team Blackhouse and in particular Anderson Silva and Lyoto Machida. With his suspension from the California State Athletic Commission up, Sonnen told MMAFighting.com last weekend that he'd go up to 205 lbs. to face Machida in his return fight, and it appears the UFC may be making that fight a reality. According to a report from Fighter's Only, a light heavyweight fight between the two is being targeted for UFC 136 in Houston in October, with verbal agreements in place. Additionally, Machida told Tatame.com that he'd sign on for that fight immediately if Sonnen wants it, and if the Fighter's Only report is accurate, the fight is all but signed. UFC 136 could feature a Featherweight Championship bout between Jose Aldo and Kenny Florian in the main event, though nothing has yet been signed for the card. Penick's Analysis: The Chael Sonnen saga is far from over, but this fight could be huge for the UFC. Machida's coming off the face kick knockout of Randy Couture, and with Chael Sonnen egging him on through Twitter and what will be even more public comments heading into the fight, this would be a very big seller for the organization. 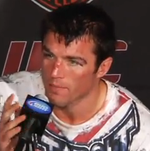 However, Sonnen still has the little matter of his "need" for testosterone replacement therapy. After what happened with Nate Marquardt, he's going to need to get approval for his testosterone usage, and that may not be an easy prospect. Of course, if his claim that he absolutely needed testosterone to live his life was a false one, as others he made to the CSAC turned out to be, then the move to light heavyweight may be in part due to getting off the treatment to not deal with the TRT issue. But if the fight gets put together and comes to fruition, it will be an immensely interesting build up, and could make for a great fight.